Lung cancer, stage I refers to a condition in which there is no involvement of the tumor in surrounding tissues, and no metastasis to lymph nodes or other organs. 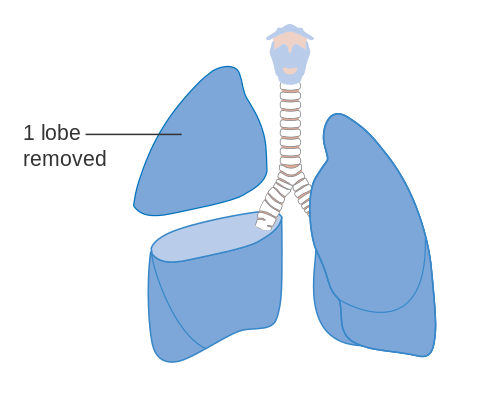 Stage I lung cancer is treated by surgery to remove a part of the lung (usually 1/2 to 1/3 of the lung). However, even those patients who underwent such proper surgery, about one-third will recur and die after all. Looking at what kind of patients have failed to treatment, if tumor less than 15mm, the probability for patients to survive 5 years after the surgery was about 95%, whereas if tumor larger than 15mm, the 5-year overall survival was only 65%. 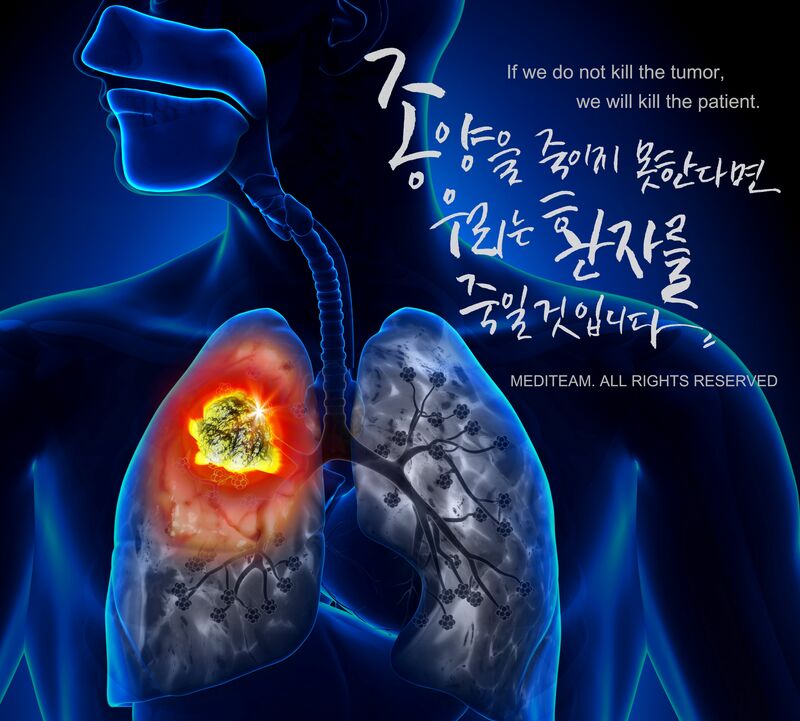 "However, a number of patients with lung cancer are not able to receive surgery"
Considering the fact that lung cancer is mainly found in elder people and those who have smoking history, the surgery itself can be dangerous even though surgery is the best way to get cured. Even surgery is impossible at all in some patients. However, if left untreated, most patients will pass away within a year. 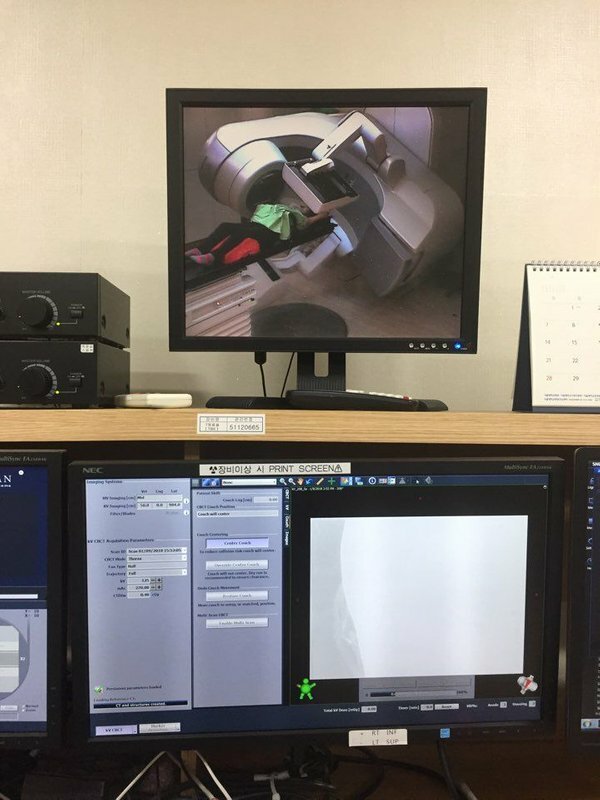 "Radiosurgery introduced to inoperable lung cancer patients"
In the 1990s, researchers in Japan started to treat lung cancer patients with radiosurgery, which had been used in the treatment of small brain metastases. The results were excellent, with only 3% of local recurrences, and later in the world, such radiosurgery or stereotactic abaltive body radiotherapy (SABR) was widely attempted. The results were very successful, with local control rates over 95% and long-term survival rates of 70-80% depending on the size. "Stereotactic ablative radiotherapy (SABR) is being attempted to treat operable lung cancer instead of surgery"
The researchers studied whether it would be possible to treat patients who are in good condition health to get surgery using SABR without surgery. Two studies involving 28 hospitals in the US, and 10 hospitals in the Netherlands compared lobectomy (standard treatment of surgery) and SABR. In a pooled analysis of these two studies, the 3-year survival rate was better in patients receiving SABR than in patients receiving surgery. This may be due to surgery-related side effects and high mortality associated with complications, but the study was small-sized and underpowered, so it seems premature to conclude which is better treatment. Accordingly, the Japan Clinical Oncology Group (JCOG) and american society of the Radiation Therapy Oncology Group (RTOG) is performing clinical trials investigating the efficacy of SABR and lobectomy to treat patients with stage I lung cancer. Optimistic researchres expect that the time will come when lung cancer can be cured without surgery, but data are still lacking, and the application of SABR is difficult if the size is greater than 3cm. However, it seems to be a remarkable development that lung cancer patients who could not get surgery were able to receive treatment in expectation of cure. Prev Article : [암스토리] 수술 없이도 폐암 1기의 치료가 가… Next Article : [암스토리] 탄 음식을 먹으면 암에 걸린다! ?